What does «well below 2°C» mean? The Paris Agreement calls to hold the increase in the global average temperature to «well below 2°C». What on earth does that mean? Holding the increase in the global average temperature to well below 2°C above pre-industrial levels and to pursue efforts to limit the temperature increase to 1.5°C above pre-industrial levels, recognizing that this would significantly reduce the risks and impacts of climate change. If we are to stand any chance of meeting the ambitions of the Paris Agreement, we first need to define exactly what «well below 2°C» means. In its Fifth Assessment Report, the IPCC placed special emphasis on the concept of so-called cumulative emissions to describe the range of temperature increase we could expect according to how much carbon dioxide is emitted in total. The concept is attractive for its simplicity: The temperature increase above pre-industrial levels is roughly proportional to the total (cumulative) amount of carbon dioxide emissions. There are nuances, but its simplicity makes the cumulative emissions concept a useful communication tool. The IPCC assessed that the global average temperature was likely to increase by 0.8 to 2.5 degrees for every one billion tonnes of carbon emitted. The range incorporates uncertainties in the climate system and carbon cycle. Using this range as the basis for a statistical distribution, it is then possible to estimate the carbon budget with a given probability of keeping the temperature increase below a given level. The IPCC often refer to a «likely chance», which they define as 66% probability of keeping temperatures below a given level, say 2°C. When the probability is greater than 50%, it means that the realised temperature will probably be less than 2°C. It turns out that a 66% probability of staying below 2°C gives a median temperature of about 1.6°C. In a recent article, Rockström and colleagues suggested a 75% probability of staying below 2°C gives a median temperature of about 1.5°C. If one interprets «well below 2°C» as a 66% probability, then it is well on the way to «limit the temperature increase to 1.5°C». This means that we can draw on the existing emission scenario literature used in the IPCC Fifth Assessment Report to study the implications of the Paris Agreement, including the 1.5°C ambition level. In other words, we already know what it takes to be “well below 2°C”! I see this as a rather intriguing coincidence, and not by design. Though, perhaps climate negotiators are smarter than often assumed! The relationship between the probability of staying below 2°C (horizontal axis) and the median temperature increase (vertical axis). The blue line indicates how these may look for a range of proposed future emission scenarios. The red line assumes the statistical relationship between the temperature increase and cumulative emissions using a normal distribution, as in the IPCC. If a 66% probability of below 2°C is roughly consistent with a 50% probability of 1.6°C, then doesn’t this mean that there is a rather big inconsistency in the carbon budgets? Yes, there are rather big inconsistencies. According to the IPCC Synthesis Report, the total carbon budget for a 66% probability of 2°C from 1870 is 2550 to 3150 billion tonnes CO­2 while the budget for 50% 1.5°C is 2300 to 2350 billion tonnes CO2. These ranges clearly do not overlap. There could be a variety of explanations for this. First, the 50% probability for 1.5°C is based on two almost identical scenarios from one model. Second, model variations can be large, and the model used for the 50% 1.5°C budgets, has a lower carbon budget than other models. Third, as I discussed earlier, there is a lot of definitional issues that can lead to differences between carbon budgets. Forth, non-CO2 emissions take a large share of the carbon budget, and the non-CO­2 emissions could be rather different in 1.5 and 2°C scenarios. My estimates assume the non-CO2 emissions are the same across 1.5 and 2°C scenarios. The lack of scenarios assessed for 1.5°C may simply mean that we don’t have enough data to estimate a carbon budget for 1.5°C. This text has a variety of potential ambiguities, but most significant is the interpretation of anthropogenic sinks. Carbon cycle scientists generally refer to sources as emissions from land-use change, and sinks from areas not undergoing land-use change. UNFCCC reporting guidelines are based on managed areas, which may include a part of the land sink that does not undergo land-use change (e.g., forest remains forest). The two approaches need to be reconciled, but it is unclear what policy makers had in mind when negotiating the Paris Agreement. The implications are potentially significant. Using the carbon cycle definition, about half of the emission scenarios with a 66% probability of staying below 2°C are below zero by 2100, and all of those cross zero after 2080. 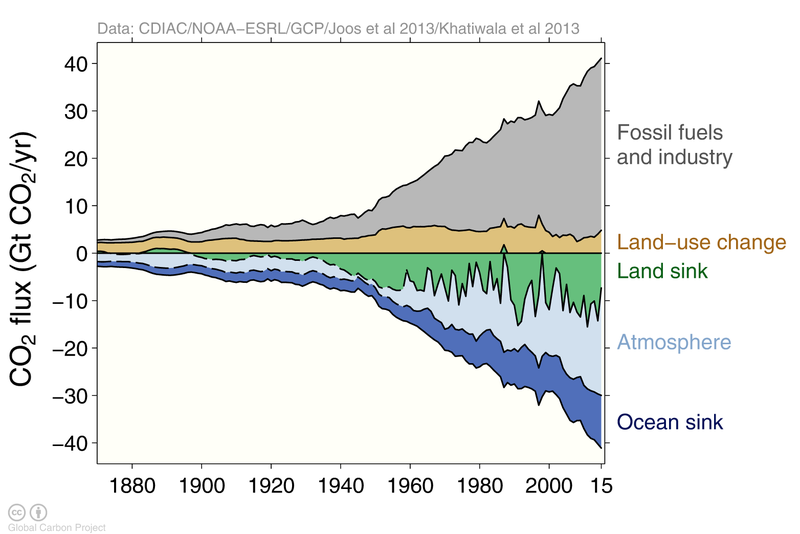 This seems somewhat inconsistent with the balance in sources and sinks between 2050 and 2100. This inconsistency needs to be reconciled. The total greenhouse gas emissions for scenarios with a 66% probability of staying below 2°C. Only half of these cross the zero line in the period 2050-2100, which is a requirement of the Paris Agreement. This suggests the Paris Agreement is either stronger than a 66% probability or there is an inconsistency in the Paris Agreement. It appears that emission scenarios with a 66% or higher probability of staying below 2°C will be consistent with the Paris Agreement’s «well below 2°C». This means we know what it takes to meet the ambition of the Paris Agreement, and there is no need to wait for the IPCC Special Report on 1.5°C.